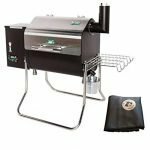 A portable charcoal grill is typically simple, and this tempts some people to look for something inexpensive, and ultimately weak. This prompts the twist of logic to look for a disposable charcoal grill. Yet a portable charcoal grill need not be a fire hazard that you leave behind with your hard earned money. 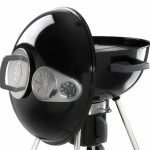 Weber steps up to prove this with their Go-Anywhere Portable Charcoal grill. It is made from high-quality steel that is coated with a durable porcelain enamel layer on the inside as well as the outside. There are two aluminum dampers built into the lid to help you better control the airflow and heat inside. The handle on the lid is made glass reinforced nylon. Inside the 160 square inch plated steel grill grate sits above a deeper-than-you-would-expect firebox. 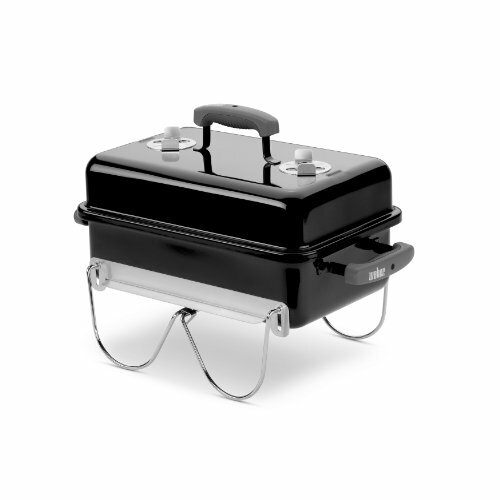 The entire grill is supported by steel plated legs that securely tuck under the firebox when you are using it. They then swing up over the lid to lock in place when you need to take it with you. Portable charcoal grills are typically thought of as being made from cheap materials that rarely stand the test of time. 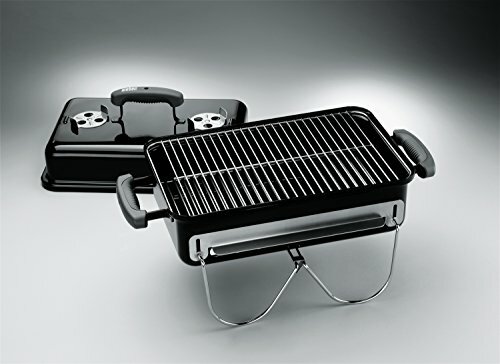 Weber goes the other direction with this grill, making sure that every component echoes their reputation for quality. The steel-plated legs are designed to fold up easily and lock into place to hold the lid for easy transport. They tend to do this very well in the early months or years. Yet as time goes on the legs can start to occasionally jam in place on time, while swinging loose another. You can get around this by lubricating the joints with graphite, where the legs meet the firebox body of the grill. A little twist of some stove pipe wire of a simple zip tie can keep the legs secured to each other when folded up. 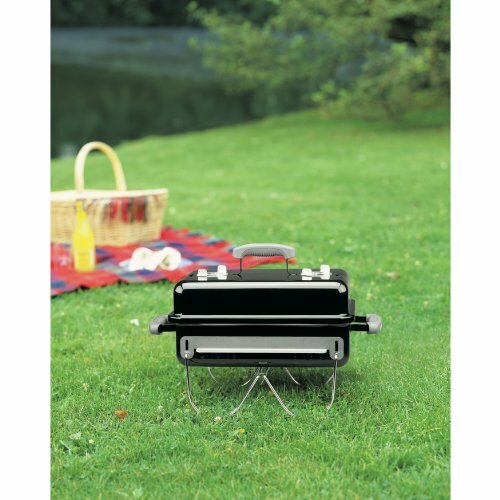 There is some online vendor who offers an expert assembly service for the Weber Go-Anywhere Charcoal grill. However, you won’t need it. Even the most mechanically inept person could still get this grill put together in under 20 minutes. It was specifically designed to not use nuts and bolts. Like a lot of other portable charcoal grills, the Weber Go-Anywhere is a little on the simplistic side. It’s a metal firebox with a grate and folding legs. Yet, when you spend some time with it, I think you’ll find it can do a lot more than just make a couple of bratwursts hot! Its rectangular shape means you can set the firebox up with a hot flame on one side, and a low to no flame on the other. Set up like this you could do something like hybrid grill two bone-in chicken breasts over low heat. Then move them over the high heat coals to finish them and crisp the skin. You could also spread a hot coal bed all across the bottom then lay out some long bamboo grill skewers for some perfectly seared kabobs. If fajitas are more your style, you could set up a medium-low pile of coals on one end for sautéing peppers and onions in a heavy-duty aluminum foil pouch. On the other side, a high heat fire could perfect sear a section of inside skirt steak or some chicken tenderloins. You could even soften the tortillas by laying them on the lid for a minute or two. 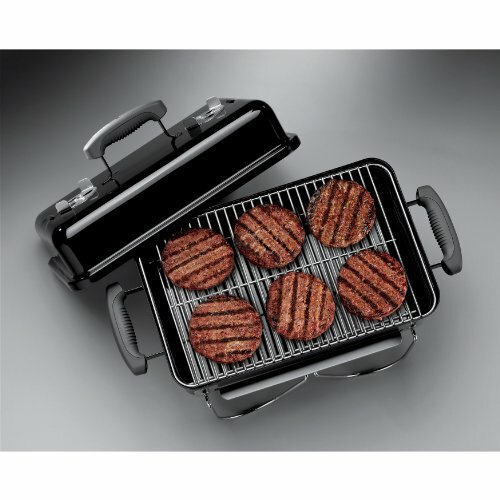 The Weber Go-Anywhere has a 160 square inch steel plated grill grate. The folding plates steel legs are something you don’t find with other portable charcoal grills in this price range. Just take the time to maintain their joints and connections over time. There isn’t a whole lot to do with it comes to cleaning out the Weber Go-Anywhere. The grill grates can be quickly scraped down with a wire grill brush. The ash and spent embers in the bottom of the firebox need to be accounted for with fire safety as a priority. If you are just sitting at camp, you might have the luxury of enough time to let the charcoal burn all the way out. Shutting down the aluminum dampers will help suffocate the fire, but the Weber Go-Anywhere still isn’t airtight. If you are tailgating before the big game or grilling out at the beach, you might not have the luxury of time to let the fire burn all the way out. Of course, the last thing you want to do is put a rocket-hot charcoal grill in the trunk of your car and drive down the road! The tempting thing to do here would be to dump some water in the firebox and let things sort themselves out. This might work once or twice without any adverse side effects. If you do it repeatedly, you risk warping the metal and damaging the protective porcelain coating inside, which leave it vulnerable to rust. Ideally, you want to carefully scoop out the ash and spent embers into a small metal bucket. Then you can slowly pour in and stir the water to make sure they are completely out. The Weber Go-Anywhere charcoal grill comes with a multi-tiered limited warranty. The firebox and lid come with a 10-year no rust through/burn through coverage. The plastic component comes with a 5-years warranty, excluding fading or discoloration. All remaining parts have a 2-year warranty. This level of warranty coverage is pretty much unheard of in competitor grills. 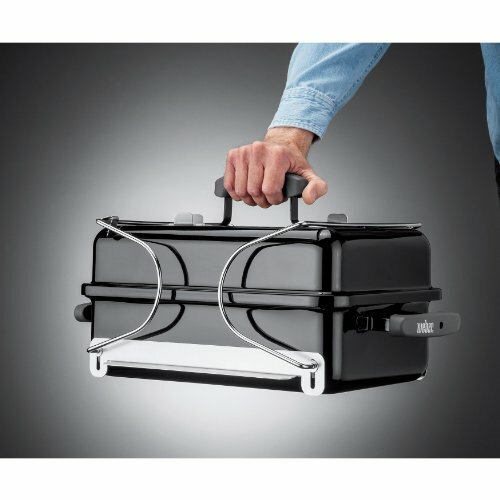 If you are looking for the gold standard in portable charcoal grills, then you need not look further than the Weber Go-Anywhere. It’s easy to assemble, easy to transport, and inexpensive. Backed by a best in class warranty, it has the quality to pay for itself and last for years beyond. Don’t let its simple appearance limit your creativity.